When's the next get together? Ive had my Delorean for a month now and am very excited to have it! I'd love to meet anyone in the San Diego area!! Hey Riley, Let me know when you have some free time, i'd love to meet other owners. Ive only had mine for a few months now but I have been non-stop with it. I go everywhere! What kind of Mods do you do? Im interested in a few things to update, like the radio is a big one! Let's plan on both a tech get-together (we could do my house out in East County/Jamul - or anyone else who has the room for the cars and tools - my work area is a little bit of a mess), and a Friday night at the Sonic in North Park on El Cajon Blvd. just west of the 805. Maybe when Riley gets back. We just need to let the other guys know too. Hello fellow time travelers from San Diego County! Not much going on in the DMC12 world these days. Mine's been out of commission since last November when the engine wire harness kept fraying and frying my starter motor(s). I'm finally getting it put back together but, as usual, I'm waiting for parts to arrive... specifically the fuel system banjo bolts. I figured I might as well replace what I can while the thing is apart... dress it up a little with new shiny bits. 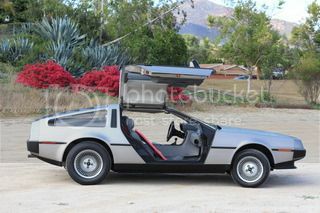 This is my 1983 DeLorean which I inherited when my father died, unbeknownst to him. He was the original owner, took delivery Thanksgiving weekend, 1982. Welcome fellow San Diego DeLorean owner! Fallbrook - nice area. I'd like to plan on getting all of us together soon before our Summer is over (even though when it turns to Fall it's still pretty much Summer). I was thinking sometime this month at the Sonic in Kearny Mesa - that seems pretty central to most of us. Whether your DeLorean is running or not, I think it would be great to meet other local owners - and maybe start a sub-club of the SoCal club for local events and drives. Welcome fellow San Diego DeLorean owner! Fallbrook - nice area. I'd like to plan on getting all of us together soon before our Summer is over (even though when it turns to Fall it's still pretty much Summer). You guys . . . . I've been to San Diego, it's summer ALL the time. Well, not when it gets down to under 35 at night in East County, and we get snow in the local mountains... but yeah, it's pretty much Summer all the time. Original owner from your father, this is really nice. You must be very proud to own his car now, take good care of it.